Polly O'Leary: Painted in three days? - Really? Painted in three days? - Really? 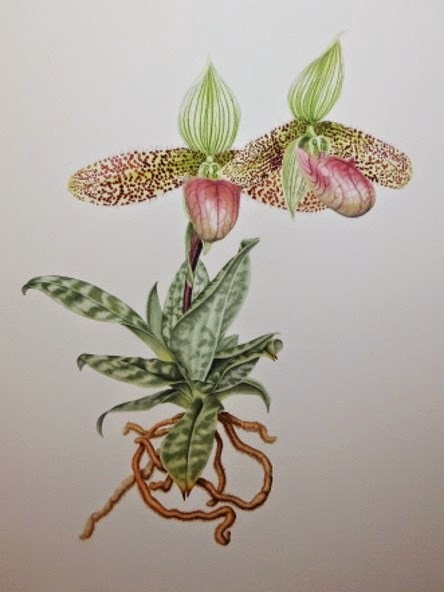 I've been thinking about this ever since I finished the Paphiopedilum sukhakulii painting. It's not a claim of taking only three days over a painting. For a botanical painting that would be just about impossible, the drawing and measuring alone take longer than that, as does the composition - for me anyway. And I need a long flowering plant, or several plants to be able to take this long, or take more than a year to finish while I wait for the plant to flower again. No, what I mean by it, is that I've got so far with a painting and then found it impossible to continue - and started again! Before getting to the painting stage, I will have spent weeks drawing, composing and doing colour and tonal sketches. Once I have the composition I'm happy with, I make a master copy on tracing paper so that, in the event of a disaster, like dropping a loaded brush on the painting, or finding that a piece of the paper isn't sized properly, I can simply use the master tracing to redraw on new paper and start painting again. This is where the 'painted in three or four days' comes in. However, to understand what it means to actually begin the painting part, and finish in three or four days, the hours involved have to be understood too. For me it involves painting almost non-stop for about 20 hours a day! So a three-day painting will have taken 60 hours, and a four-day painting will have taken 80 hours, for the application of paint alone. And yes, it's hard having about 3 hours sleep a night, but if that's what it takes to get the painting finished by a deadline, then that's what happens. Looked at like this, I'm still taking the same time to paint as normal, just cramming it into a smaller time frame. So that three-day painting is actually two and a half weeks of painting, and the four-day painting is easily three weeks worth of painting really. It isn't something I like to do, and it certainly isn't something I plan. Usually it's the result of poor or uneven paper sizing, which can't be seen until you're actually experiencing it. Under these circumstances it's often much easier and quicker to start again, rather than try to compensate for the lack of size, and of course the result is better too. Haha Vi, so much trouble with paper since !